A declining birthrate and aging society will shadow various industries. Housing, insurance, education, bridal. Damage to the toy and the plastic model industry is intense. If children decrease, sales will fall mercilessly. The market of the plastic model which many adult enthusiasts love is also not a masterpiece. If you get older and the presbyopic progresses, the detailed work normally associated with making a plastic model becomes tight and the plastic model departs. That is why Tamiya (formerly Tamiya model) boasting a lineup of more than 5000 hobby items such as mini 4WD, radio control (RC) car, plastic model, etc. is proactively entering overseas. North America, South America, Europe. 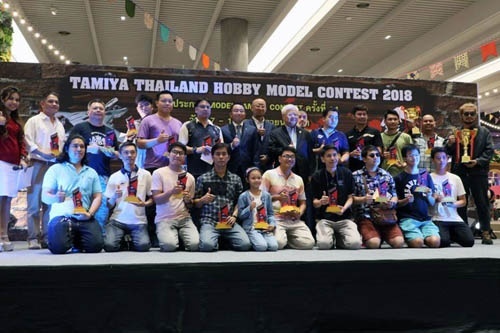 It is Siam Tamiya founded in 1992 that has been responsible for developing the market in Thailand while Tamiya’s distribution network is being built around the world. Prior to that, in Central Thailand, the major distribution center Central Group had sold Tamiya products as agents, but it ended in low altitude flight. Would like to revitalize the Thai market, which is a hub of Southeast Asia. Tamiya who thought so did set up the arrow of bare feet, Mr. Kenji Suzuki who moved to another company after working for an agent in Tamiya in the USA, and was assigned to Thailand. The chance was a NHK program that took up Ms. Suzuki who works in Thailand. The president of Tamiya who happened to see the program contacted Mr. Suzuki and offered an offer saying “I want Tamiya products to be sold in Thailand” and Siam Tamiya, who operates Tamiya’s regular sales and import business, was established in response to this request It was done. This is why Mr. Suzuki, who is currently the representative of Mr. Suzuki. Mr. Koji stayed in a language course in Thailand for about two years since 1989 when his father was in Thailand. Although he went back to Japan once, he returned to Thailand again at the time when Siam Tamiya was founded and participated in management . Unlike Japan, many Thai people have not experienced touching plastic models or RC cars in their childhood. I have never made it or have not seen it. How should such Tamiya products be sold in countries where such children are not rare? Two parents and two people set aim for mini 4WD with small power as a key to the market development. Mr. Gorde looks back. However, just placing mini 4WDs on the sales floor can not hope for success. It is evident from the failure of times before Siam Tamiya. In Thailand with no plastic model culture, it is indispensable to have a place where you can experience the fun and entertainment of the mini 4WD with power, as well as being able to take it with hands by looking at the products. 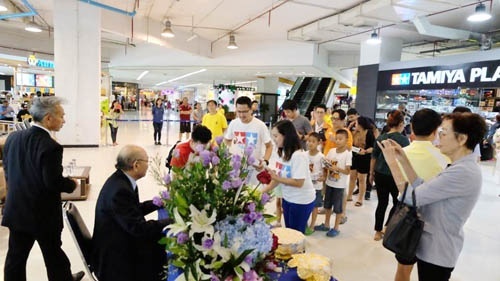 So Siam Tamiya borrowed the shopping malls in the center of Bangkok and the eaves of Jusco (then) and held a mini 4WD competition on a weekly basis. Participation fee is free. It is a place where you can compete against how quickly you can score without going out of the track, running the mini 4WD you assembled with each other’s thoughtfully using a rich body, chassis, upgraded parts etc. There are 3 to 5 mini 4WDs that can run at once in the course. Children in Bangkok are crazy about trying to race until the winner is decided and to present the trophies and Tamiya products to the winners. The price of mini 4WD is 198 Baht. It is not cheap but it is not a price not available. Fun to remodel and improve performance was accepted in Thailand, and when I noticed, the mini 4WD boom swept over Thailand. Frenzy appeared as numbers. The sales surged. It was good to say that it was an explosive big hit. However, the popularity led by the boom was fragile. Siam Tamiya survived and steered to strengthen the RC car, judging that it is a very difficult task to extend the mini 4WD which the boom went away before it was established. Unlike mini 4WD of 198 Baht, the price of RC car is over 10,000 Baht. Considering that the initial salary of Thailand at that time was 8000 to 10,000 Baht, it was not a product to be obtained at a late afternoon, but as with the Mini 4WD 4, a strategy to steadily increase fans by putting emphasis on race-type events It was launched. In 1998 I was promoting RC car educational activities steadily. Again, the Mini 4WD boom came. What caused the unexpected boom is manga and anime from Japan again. The program which animated “Broke Brothers Let’s & Go!” Serialized in “Korokoro comic” is a big hit with the popularity of Thailand’s popularity. It pushed up sales of Mini 4WD again. However, this boom also ends short lived. The third mini 4WD boom that occurred in Japan spill over Thailand around 2004, sales temporarily increased, but again it did not last long. When the boom happens, it stretches, and it goes down greatly. Here Siam Tamiya intends to make a big change in direction. Mr. Suzuki has made another bold decision at this time. It is withdrawal from department store. Siam Tamiya, such as Central and Mall Group, had ten sales floors in major department stores in Thailand, but with all that in mind. The reason for withdrawing is bad efficiency. And it’s a small choice for customers. This judgment raised more than expected results. Sales were down only for the first few months. Wholesalers to other retailers such as radio control shops increased, and the figures turned to an upward trend soon. The treatment at the specialty shop grew only because it became a product not dealt in department store. The effect of the large event of the mini 4WD which is held every month as a circuit specialized in large shopping mall such as seacon square and fashion island is great. Circuits that appeared in shopping malls where young people spend their holidays contributed to the development of new fans and increased repeaters. Regardless of presence or absence of a boom or big or small, the opportunities to try out the performance of mini 4WD and RC cars made by themselves, and regularly have other people see the opportunity, the motivation of the fans increased, “I I want to participate in the new customer who burns motivation. ” If you see the world top level battle, the number of heavy users trying to aim at a higher level will increase. The road chosen by Siam Tamiya who has been keen on boom is simple, but it is the most effective and sustainable way to convey the appeal of its products. In October 2018, we opened a “Tamiya Plastic Model Factory” that is different from conventional shops at shopping malls and shelves, located in the outskirts of Bangkok. To the opening of Shiro Rangsit shop, Mr. Tamiya Tamiya, Chairman and President of Tamiya Head Office, visited Japan from Japan. Many fans attend the announcement of “Mr. Tamiya visit”, until the signing party is held at the store. It is evidence that the enthusiastic fans of “Tamiya” have increased, and the brand has penetrated Thailand. Plastic model culture is also growing. Today Siam Tamiya’s sales are 40% mini 4WD, 20% RC car, 20% plastic model. Plastic model sales have caught up with RC cars. Female fans, parents and fans of two generations also have increased. It is not unusual to have a family visit and spend most of the day at a Tamiya shop. It is not only that the fans are growing up in a wide range of people because Thai people ‘s income has risen and they have started to pay for leisure and hobbies. It is because I have continued to withstand and continue the event without being caught in the immediate numbers. “Because it’s a mini 4WD and RC car just running,” Suzuki said. Make places to convey the appeal of products, narrow sales channels, think efficiency. Siam Tamiya “I’ve been running these in a persistent management” is a reliable partner of Tamiya’s global strategy. This entry was posted in Event Report, Tamiya Company on December 3, 2018 by admin.